I love the caramely goodness of brown sugar. 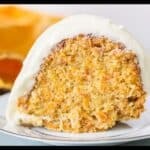 I think it gives such a richness and depth of flavor to baked goods, especially cakes. 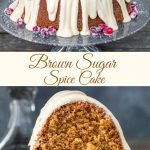 This Brown Sugar Spice Cake will not disappoint and is the perfect way to finish off a holiday meal plus it makes a really beautiful centerpiece on your table. 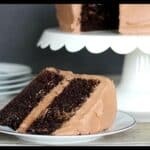 The cake itself is a more dense texture that still remains moist. It’s got a nice hint of spices running through it along with the richness of the brown sugar. 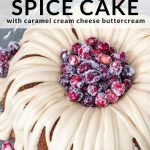 It’s then topped off with a thick coating of caramel cream cheese glaze. You won’t be doing anything fancy with the mixing method on this one. It’s the average creaming method and then you’ll add in the dry and liquid ingredients alternately. The cream cheese glaze gets its caramel flavor from melted caramel chips. Using the chips makes it much easier, but you could even make your own homemade caramel in place of that if you feel industrious. I finished the cake off by adding in some sugared cranberries to the middle. 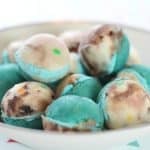 I’ve provided the link to the super easy recipe I used to make them. 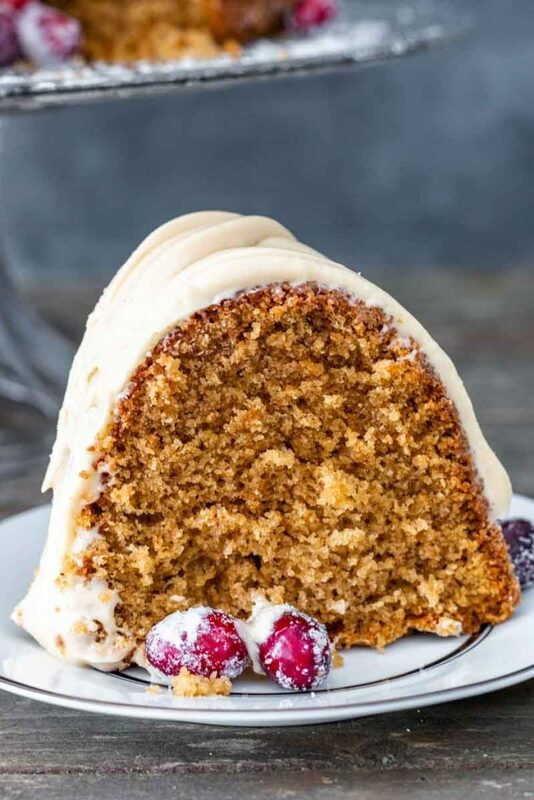 I really like the tartness of the cranberries with the rich caramel flavor of the cake. 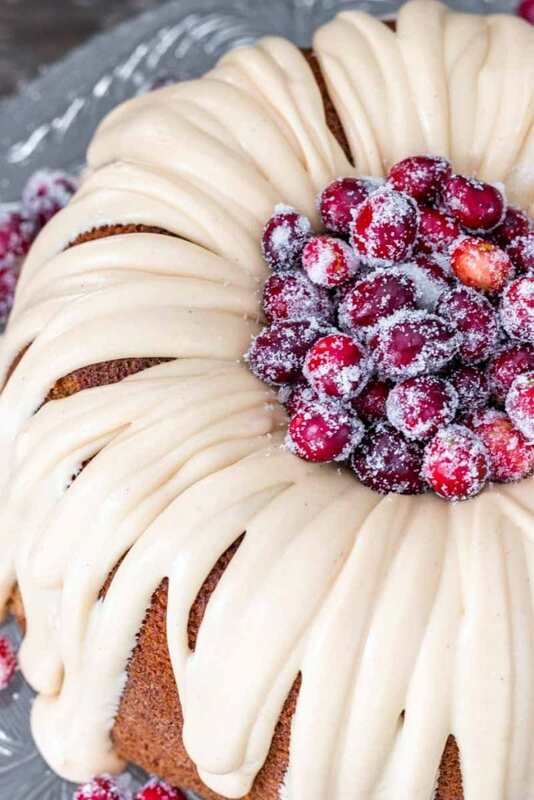 The cranberries are certainly optional, but I think they make the cake so pretty, right? Either way, I think you’re gonna love this cake. 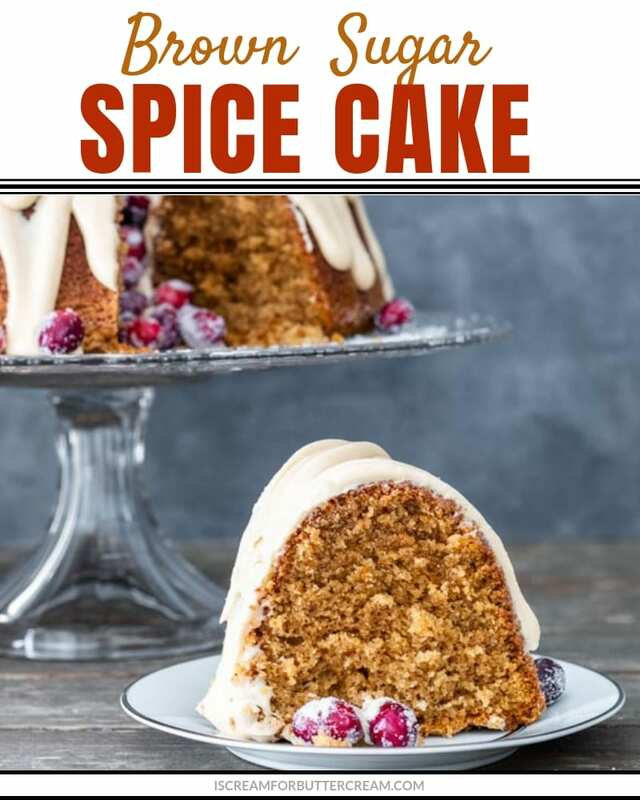 Nothing says autumn more than a delicious and moist spice cake. 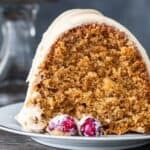 The deep flavor of the brown sugar spice cake goes so well with the richness of the caramel glaze which isn't your normal topping for a spice cake, and that's what makes this the perfect fall cake. In a medium sized mixing bowl, add the flour, baking powder, baking soda, cinnamon, nutmeg, ginger, cloves and salt. Whisk well and set aside. In another bowl, add the milk, oil and vanilla. Whisk well and set aside. In a large mixing bowl, add the room temperature butter and the brown sugar. Mix on medium to medium high for several minutes until light and fluffy. Add in the eggs two at a time, mixing on medium after each addition, but only until just combined. Alternately add in the flour mixture and the milk mixture. Add in 1/3 of the flour mixture and mix on medium just until combined. Add in 1/2 the milk mixture, mixing on medium just until combined. Add in another 1/3 of the flour mixture, mixing only until combined. Add in the last of the milk mixture, mixing only until combined, then the last of the flour mixture and mix until well combined. You only want to mix until well combined, about 20 seconds. Scrape down sides of the bowl and mix again only for several seconds. Mixing for several minutes is too long. Bake at 325 degrees for about 50 minutes. Cool in the pan on a wire rack for about 20 minutes, then turn out onto a rack or a cake plate and cool completely. If using caramel chips, melt the chips in the microwave. Just set the timer about 20 seconds at a time so they don't scorch and mix between each time you heat. Stir until they're smooth and melted and set aside while you mix up the glaze. In a medium sized mixing bowl, add the softened butter and cream cheese. Mix on medium until smooth. Add in the salt, vanilla and confectioners sugar. Mix on low at first until incorporated, then on medium until its well mixed. Add in a tablespoon of milk or cream and mix well. Scrape down sides of bowl and mix again. Add in the caramel. (You can use either melted caramel chips, homemade caramel sauce, or jarred caramel sauce.) If you're using melted caramel chips, add a small amount of the cream cheese mixture to the warm melted chips and mix together. Then add back to the glaze mixture. Now just mix until smooth. Depending on the type of caramel you used, you may not need to add any milk or cream to thin down your glaze. If it's too thick, add a tablespoon of milk or cream at a time to get it to drizzling consistency. 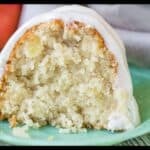 Since this cake contains cream cheese in the glaze, it will need to be kept in the refrigerator. You can take it out about 20 minutes before serving, so it can get a little closer to room temperature before serving. I LOVE your blog. I came across it a while ago and was immediately hooked. I feel at home when I read things like “pretending your in the GBBO” and this week, ” Pintrest for an hour and then exhausted and went to bed” haha! Thanks for the great content! It’s now fall and I wanted to make something to fit the season. 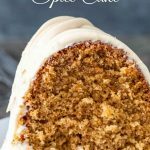 I love spice cake, so when I found this recipe last week, I made bundtinis. They turned out amazing! 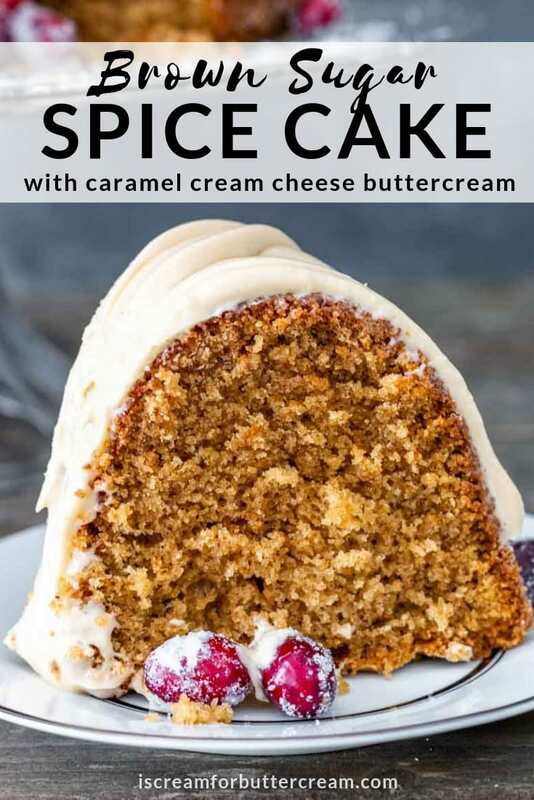 The spices were a perfect blend and the cake was moist. 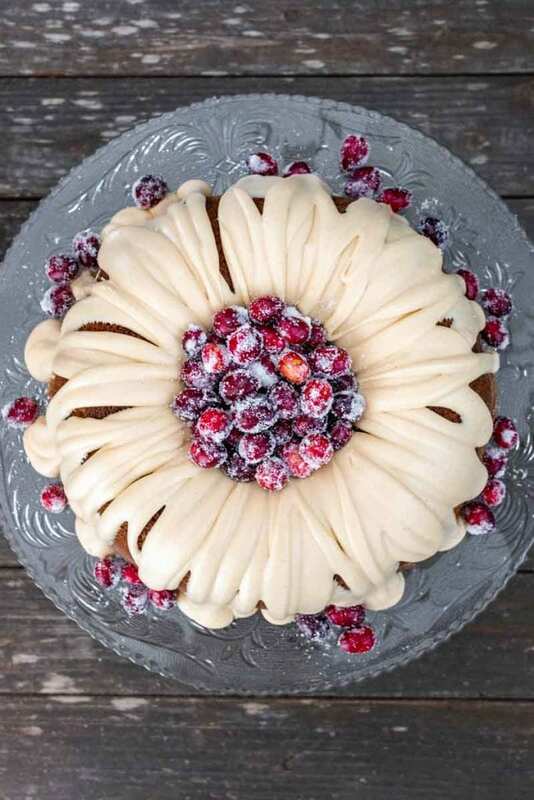 The cranberries can be a bit tart but are balanced well with the sweetness of the frosting. 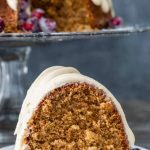 I decorated each bundtini with a small edible leaf to give it that perfect Fall look. 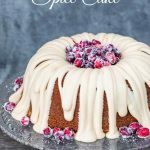 I’d like to make your spice cake with cranberries. Do you need to cook the cranberries first before you sugar them? Also I would like to make you vanilla cake with cranberries in the cake. Again would the cranberries have to be boiled first or just add them directly to the batter? Hi Anthony. Merry Christmas to you! To make the sugared cranberries, you don’t have to cook them first. There’s a link in the recipe and in the post for the recipe/tutorial I used to sugar the cranberries. It’s really easy to do. 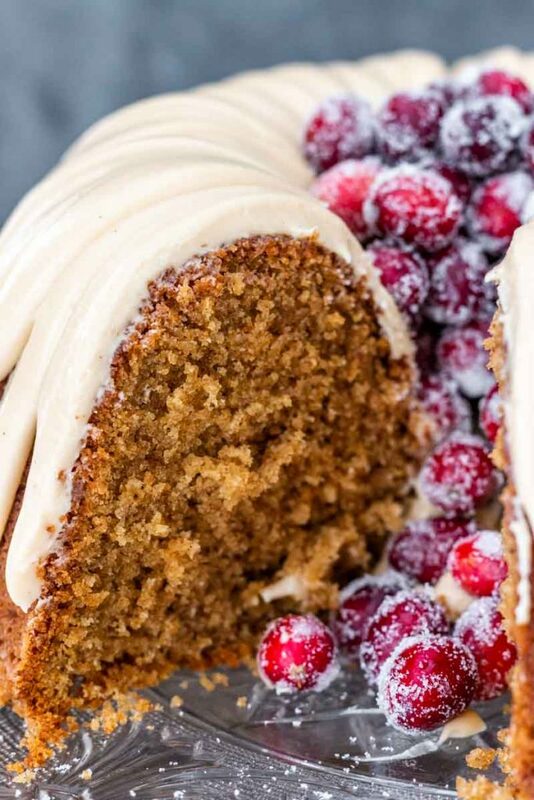 As far as adding cranberries to the vanilla cake, that sounds really tasty. You don’t need to cook them first, but you might want to coarsely chop them a bit, so they don’t sink to the bottom of the cake batter. You don’t want to chop them into tiny pieces though. Once coarsely chopped, you can coat them in a bit of flour before you fold them into the batter. That’ll help them not sink as much. Hope this helps!